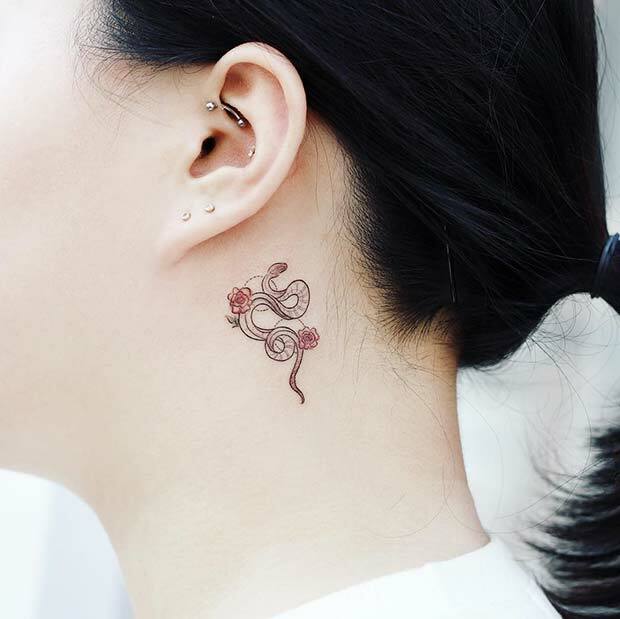 A snake tattoo can symbolize many things from fertility to eternity. As a snake shed its skin, it also carries the meaning of transformation, rebirth and healing. We love the symbolism because it shows that we too can let go of what no longer serves us and move forward. As the snake is an empowering design, it is perfect for women who need some motivation or for those have moved on to better and brighter times through the bad. 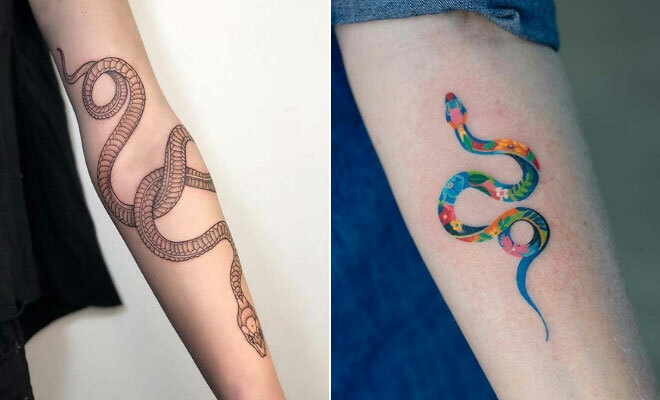 To show how you gorgeous these tattoos can be, we have found 23 of the best snake tattoo ideas. There are colorful snakes, snakes with floral patterns and more. Take a look, there is something for everyone. 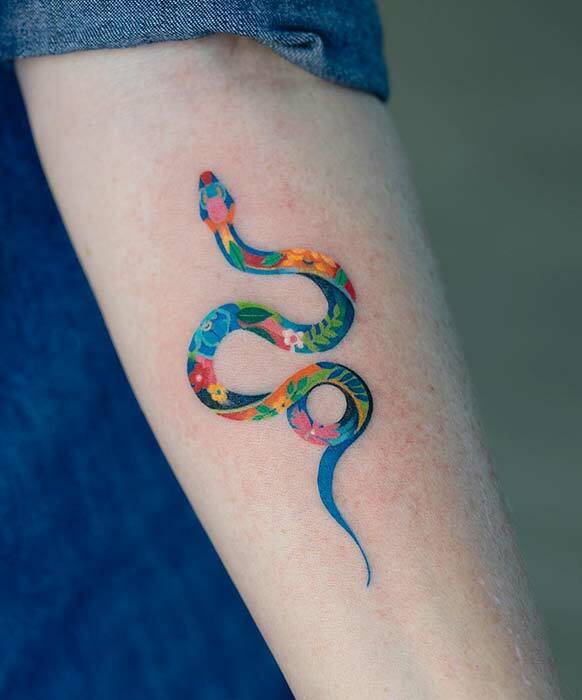 First up we have this unique and colorful snake. The snake is blue with a floral design. 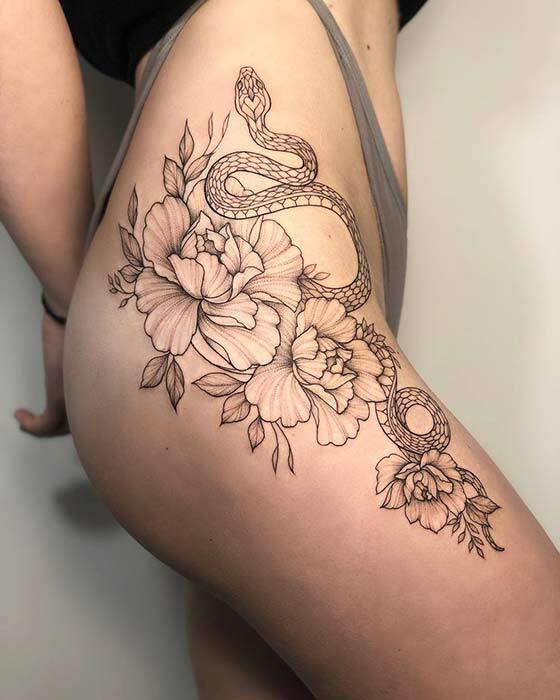 We love the use of flowers instead of the snake print because it gives the tattoo an artistic, creative and unusual look. You can recreate something similar or change the snakes main color. Also, you can use different flowers and patterns that have a meaning to you. Next, we have a thigh tattoo which features a large snake that is surrounded by peonies. The peonies just give the snake a more elegant, delicate and pretty look. Try a black outline design like this or you can add color to brighten up the tattoo. If the peonies are not for you, then you can recreate with any flowers of your choice. Roses would look cool also. Looking for a small tattoo? Then check this out. Here we have subtle snake design that is tattooed near the ear. A design like this is perfect for anyone who wants a low-key tattoo that can be covered up or shown off. Try a snake like this or you can choose a snake with a different pattern. You can also opt for different flowers or have no flowers at all. If you prefer bolder tattoos, then this could be perfect for you. 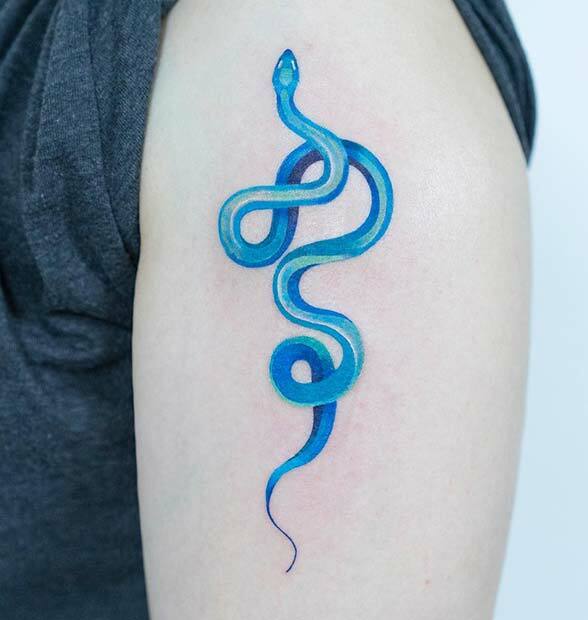 Here we have a cool, blue snake tattoo. The different shades of blue look awesome and they really bring the snake design to life. You can have a similar blue snake tattooed anywhere. A design like this would look fabulous on the arms, thigh or ribs. You can also try a different color instead of blue too. Sternum tattoos are so stylish and next we have a gorgeous snake design to show you. 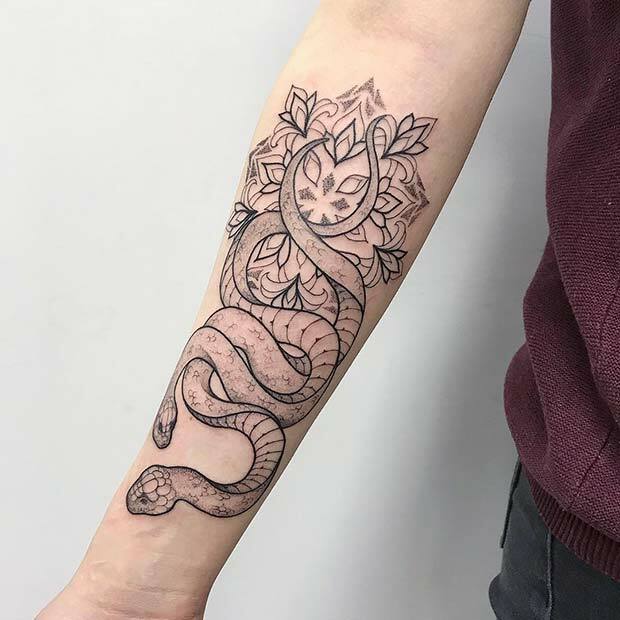 This tattoo features a black ink snake with a unique moon and stars design underneath. A tattoo like this will look stunning on anyone. 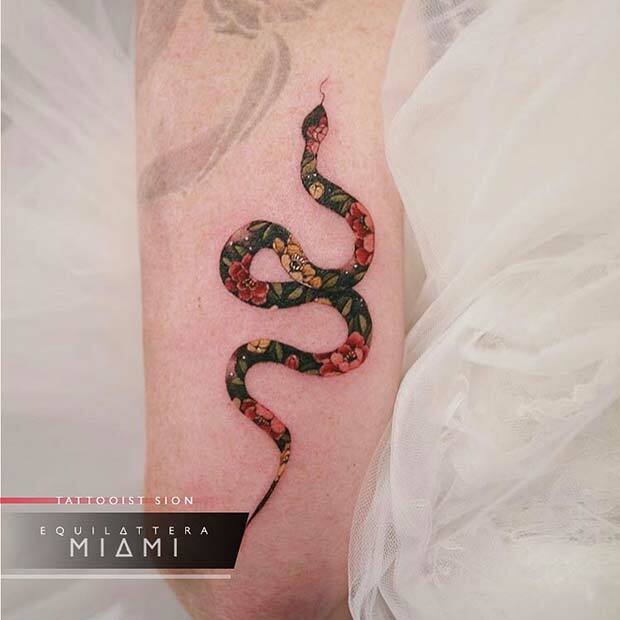 Recreate a similar tattoo or you can choose a bolder snake design with color. Our next idea is unique and beautiful. This design features a snake that is decorated with a stunning floral pattern. We love the colors of the flowers as they really stand out against the dark background. This is a creative idea and it is perfect for someone who wants an unusual tattoo that will stand out from the rest. Try a floral design like this or choose your own flowers and colors. Next, we have another stylish and cool design. 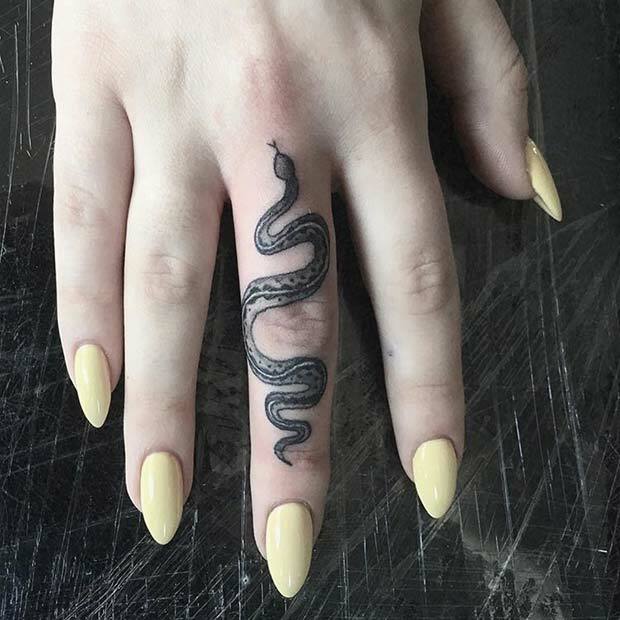 Here we have a snake that has been tattooed on the finger. It is such a trendy and edgy design. This would be the perfect tattoo for someone who wants body art that can be shown off in style. Recreate this or you can try a snake with a simpler pattern. Mandalas have become one of the most popular tattoo designs. Pair a mandala with a snake and you will have one must-have tattoo! This design is an awesome example. The tattoo features two snakes with a mandala in the background. We love this idea because each tattoo can be unique due to the endless mandala designs that can be created. Try two snakes like these or you can choose just one. The next tattoo is one of a kind. This design features a snake with two heads. The snake is tattooed on the arm and it features a cool, striped pattern. A tattoo like this would be a great choice for those who like unusual tattoos. You can have any species of snake created and you can add color too. If you are looking for a bold piece of body art, then you need to see this next tattoo! 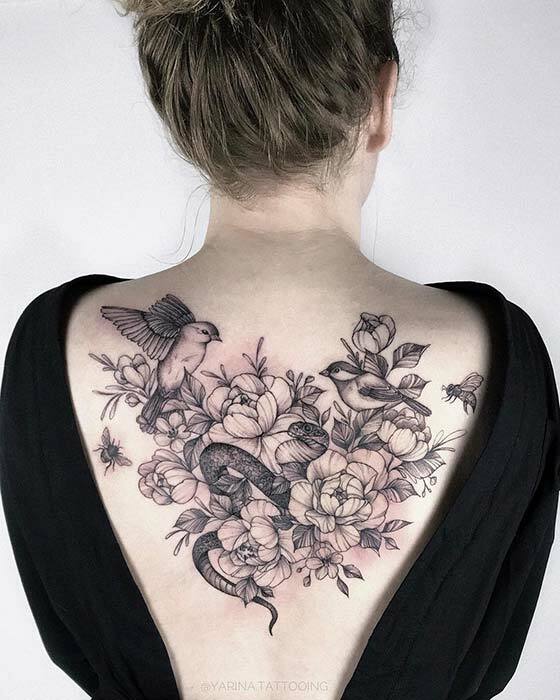 This design features lots of flowers, a snake, two birds and bees that are all tattooed on the back. It is a beautiful, botanical design that will look amazing on everyone. You can recreate this or choose your own types of flowers, birds and snakes.